As much as my chef’s training at Le Cordon Bleu has made me a better cook, it seems to have left one other everlasting side effect on me: a frequent and fervent craving for old-school French food. And I mean the really old school stuff. Like a good ol’ Bechamel or demi-glace sauce. Everything from rillettes to terrines… cassoulet to boullabaise… soufflés to tarts. And if there’s one spot in London serving up old-school French dishes that’s up there with the very best you can find in France, it’s this cosy, corner bistro on Bermondsey street. 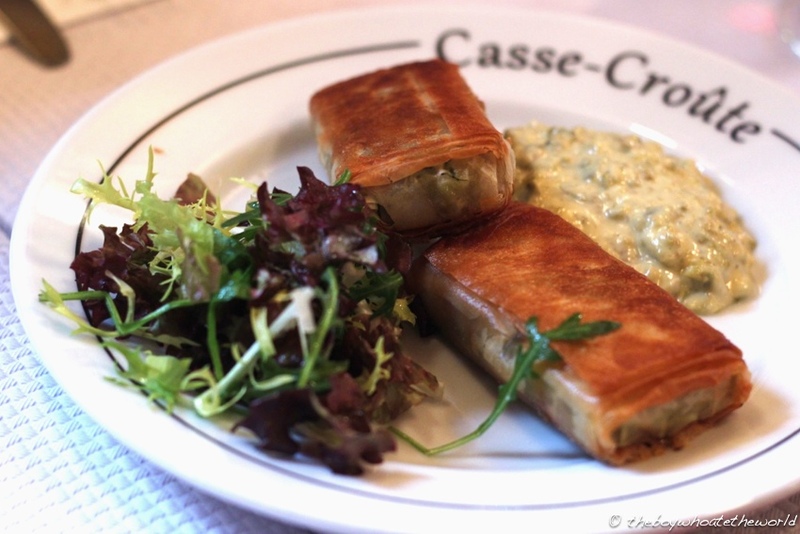 Every iota about Casse-Croute is unashamedly and fabulously French. The walls are decked with copper pans and vintage posters screaming the likes ‘La Batistine Grande Liqueur’. Their short, ever-changing menu is scrawled on a little wall-mounted blackboard (all in French of course). An all-French winelist available by the glass offers good value, featuring many of the country’s most renowned terroirs. Even the staff answer the phones in French when you call to reserve a table. And yes, every dining table here is adorned with those classic, red-checked tablecloths. On first looking, all of this could be a tad overwhelming for anybody who isn’t French. However, their charismatic and charming front of house team have a way of making you feel right at home here. A big, warm smile greets every single guest as they walk through the front doors. And don’t worry if you don’t speak a word of the language. Great care is taken in translating and describing every single dish and their respective garnishes on the menu to non-French speakers. In my past couple of years of dining here, the kitchen has rarely ever put a foot wrong. A few dishes in particular though have been especially memorable. Tender pig’s trotter, wrapped in crisp filo pastry (Croustillant Pied de Cochon) and served with a mustard and gherkin-spiked sauce was moreish, balanced and utterly delicious. 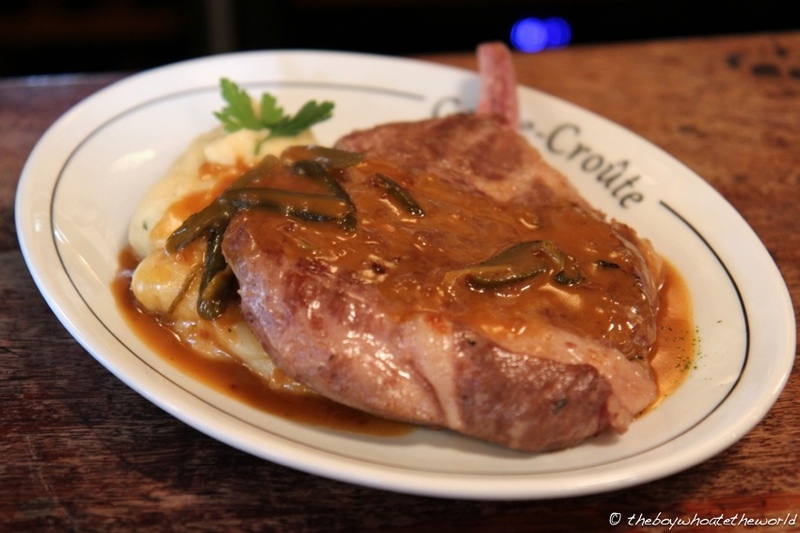 A beast of a Basque-style Pork Chop (Cote de Porc du Pays Basque) from a recent visit was cooked sous-vide until melt-in-the-mouth tender and given a final sear on the grill for maximum flavour. But if there’s one dish of late that has seriously blown my socks off, it’s their phenomenal Pigeon en Croute – moist, rare deboned pigeon… seared foie gras…. 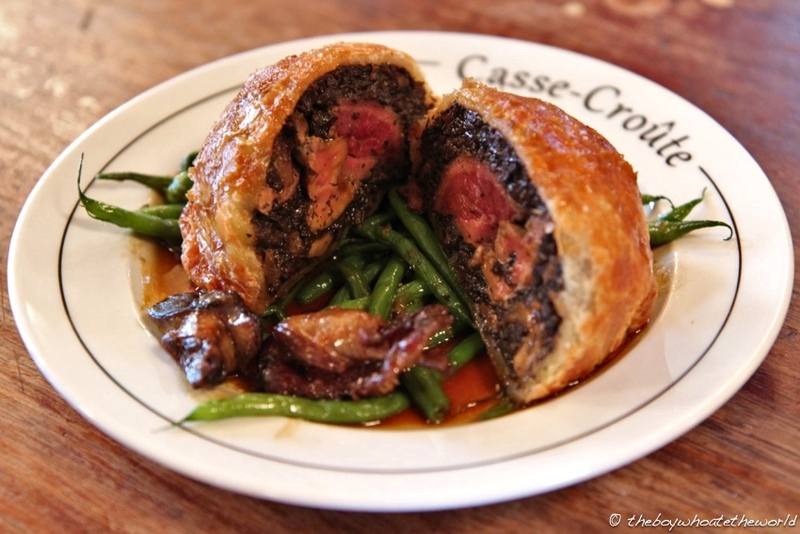 earthy wild mushroom duxelle… all wrapped in caul fat and the most buttery of pastries. Every single element from the pastry to pigeon, duxelle to sauce was pitch perfect. It’s quite simply one of the best dishes I’ve had all year (I’ve already had this twice in the span of this month alone!). Puddings are always a highlight here so make sure you have that separate dessert stomach at the ready. I’m still dreaming about their Pain Perdu (French Toast) from our last meal there – pillowy soft, beautifully caramelised and served with a generous helping of apricot compote. Expect to see other old-school classics from their signature Paris-Brest to seasonal fruit tarts sporting everything from apples to oranges, mirabelles to strawberries. Save yourself the Eurostar fare, this really is classical French cooking of the very highest order. ← Akelare, Arzak or Berasategui: Which 3 Michelin star restaurant in San Sebastian is the one for you? Even as a vegetarian it looks fantastic. The orange and meringue tart looks delicious. Keep on eating the world and we will enjoy it. Skype has established its internet-centered buyer beta on the entire world, right after launching it largely within the U.S.